Having trouble wth the blog today, so first text, then photos. I promise I will write that blog on Why Blog At All, but it’s been a thought-provoking kind of day – my 58th birthday, and thanks to many of you for the kindest of emailed wishes – and there are Other Things that are calling out to be shared. Southern Germany, eastward today along the northern edge of the achingly beautiful Alps, is very familiar territory for me. Following the route of the official Lake-Constance-Koenigsee bike track (teutonically efficient state-financed signs, pictured above, and none of the well-meaning, charity-supported but amateurish Sustrans stuff that we have in England) has taken me today (67 miles, seven hrs in the saddle) from my former sister-in-law’s in Wertach, past where Jutta and I married in 1977, to where I’m now quartered for the night, in Ohlstadt, where her parents/my former in-laws once lived. We used to come by here, just a few hundred yards from where I’m writing in a lovely German pub that is of course open till late, in the late 80s and early 90s with the kids to collect the in-laws’ caravan for mad, totally overloaded windsurfing holidays in former Yugoslavia, down on the Croatian coast. Before Yugoslavia also became former. As in the John Donne poem which we used to sing in the church choir in Barnet, the former things are passed away. Donne’s religious vision assures us that God shall wipe away all tears, and whatever your understanding of divinity, time of course does heal. Still, when marriages die, tears are shed and things are broken that can never be put back together again. It was so lovely to see my ex-sis-in-law Carola, for the first time in a decade, in the picture above this morning with her absurdly beautiful living room view of the mountains. We drank rather too much bubbly, Italian and Hungarian, and Reminisced with a Capital R. About skiing in the local mountains 20 years ago, about holidaying with our collected kids in Croatia, about families, about parents living and no longer living. And then in the afternoon, the Official Bike Route took me (minus half a pannier’s worth of unnecessary clobber now being posted, thanks to Carola, back to England) surprisingly past the equally ridiculously beautiful church in the Wies where Jutta and I married 31 years ago. The 18th century Wies (simply “Meadow” in German) is set in the forested middle of nowhere in an unreal kind of Windows XP welcome screen landscape (sorry girls, blokes will understand) hard up against the Alps, and with grass so green and skies so blue they must have been painted. Rococo within, and an organ so silver and so celestial (again, see pix) that it’s as if the architects and the builders were able to capture Donne’s vision of a world beyond this reality where there shall be but one equal music, one equal light. 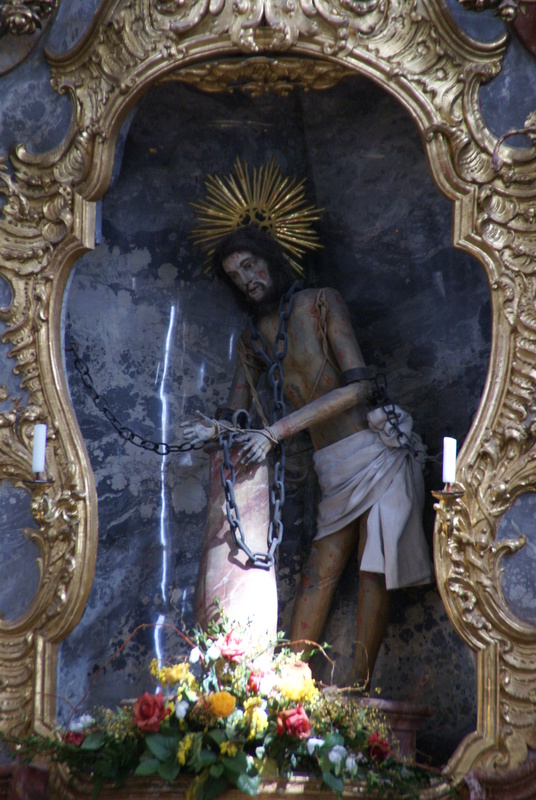 But the Wies also has a statue of Christ above the altar, the Scourged Saviour as he’s known, who, Mel Gibson-like, is being very seriously tortured. 3-D, chains, Crown Of Thorns, the works. Exquisite beauty all around, but focusing on a portrayal of sadistic brutality. A reflection perhaps of the human condition. And of what it can feel like at first when a relationship breaks down? People mean well when they get married. Of course, they intend it to last. But architecture, ritual and ethereal symbolic context can’t substitute for the hard subsequent slog of making marriage work. And sometimes we can’t. It was strangely curious, but also good, to see, courtesy of the verger, the 1997 Wies Book of Marriages with its record of one local Bavarian girl marrying one Reuter corresondent with home address at the time in 1977 in East Berlin. But – an absolutely critical question – how long does one carry the hurt of disappointed hopes and good intentions, and when do they truly and finally turn into just memories, no longer burning in the present? Hard to say, and something always stays. But it’s been an important, Gestalt-processing day.